Recent research suggests that flying cars could eventually be a sustainable way to free up roads. The first models are set to hit our skies in 2019 as personal playthings, while industry sees them as taxis and commuter vehicles of the future. But as Harry Potter's encounter with the Whomping Whillow reminds us, flying cars can be dangerous. Before futuristic visions of three-dimensional sprawling city traffic can approach reality, there are some serious safety issues that need addressing. The aviation industry is risk averse, and understandably so. Accidents in the air tend to have much more severe consequences than those on tarmac. Obtaining a pilot's licence for small aircraft is therefore a rigorous, time consuming, and costly process. For this reason, large-scale flying car operations are likely to be automated – and that means relying on GPS. Whilst GPS is usually a reliable technology, it is fallible. Susceptible to signal jamming and easily interrupted by atmospheric conditions, current aviation regulations prohibit it from being used as primary means for navigation. Automated road cars use infrared laser technology (LIDAR) to support GPS data, scanning the environment to calculate the distance to nearby objects. However, such technology currently only reliably functions up to 100 metres away. This isn't a problem on roads, which have many nearby features enabling quick relocalisation when the GPS signal cuts out. But the aerial environment isn't littered with crossroads or traffic lights. Research is underway to develop LIDAR capable of detecting objects further afield, it is by no means certain that this could ever be available at a cost-effective price. Even if static objects could be reliably detected, finding a way to safely weave through the moving ones remains a significant research problem. Automatic dependent surveillance–broadcast (ADS-B) technology allows aircraft to inform each other of their position, but aircraft such as gliders and microlights operate without power and so cannot use such systems. Commercial traffic flies in pre-defined air corridors at high altitudes, avoiding the chaos below. Flying cars, on the other hand, would operate at the same lower altitude band as light aircraft, where route planning is much freer. Malawian government trials of autonomous drones along geofenced air corridors in relatively empty skies have passed without incident, suggesting that in sparsely populated terrains, flying car air corridors may have a future. 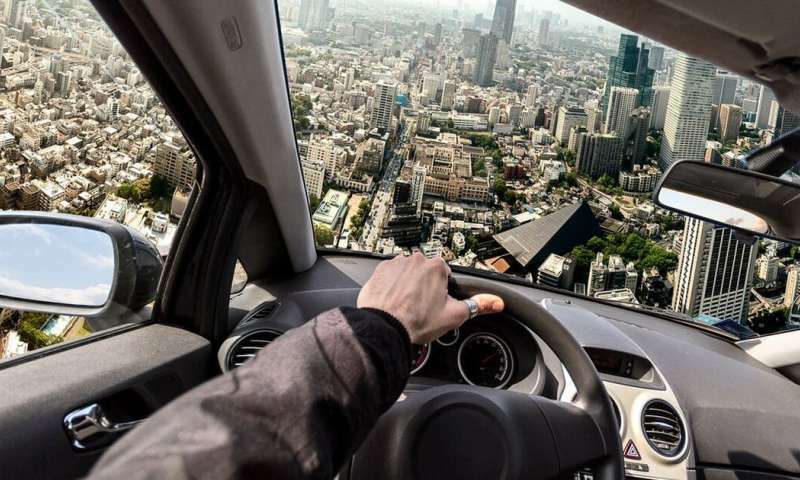 However, despite only improving emissions efficiency for long-distance travel, many companies are investing in the vision of flying cars as inner-city taxis and commuting vehicles. For example, Opener's BlackFly, set to go on sale in 2019, has a range of just 25 miles. Given that the success of automated air corridors relies on GPS for geofencing, and on powerless aircraft to be aware of and avoid air corridors, flying car trials in busier skies may not have the same outcome. In these crowded environments, both accidents and mechanical failure could have catastrophic consequences. Risk of collision aside, operating standards must be exceptional, and safeguards must be built in to prevent loss of control in the event of mechanical problems. How to land a helicopter without power. The most promising and scalable flying car designs are winged, with multiple tiltable electric fans or rotors. These are reasonably safe when cruising as they can glide for substantial distances to safety if trouble hits. However, their vertical take off and landing requires sustained maximum thrust, placing significant strain on the motors at exactly the time when power failure is likely to have the most severe consequences. Top notch health monitoring systems can predict developing issues by measuring irregular vibrations or temperatures, but this only mitigates risk. Genuine safety is only achieved by developing mechanical architecture that allows the vehicle to land safely when key components fail. Helicopters, for example, can land safely even in the event of power loss by angling the vehicle downwards and using the flow of air to keep the rotors spinning. Currently, there is no equivalent solution for flying cars except for the creation of large designated landing areas – hardly feasible in already crowded cities. Of course, with companies putting serious money into making flying cars a reality, it is likely only a matter of time before solutions are developed and we see them in our skies in some form. But as the first deaths by driverless cars show, new technology is not always safe. We must be vigilant to ensure that increasing access to the skies does not play too much with our lives. The future of flying cars: science fact or science fiction? Society is made out of cowards, that is why change is so unlikely. Every major tech innovation comes with a group of "men" who are fatalist. Everytime they remind me of the situation when someone was trying to teach everyone to read: Oh everyone is going to go blind now, reading is so dangerous, nobody will ever pay attention because they do not need to pay attention since they will find everything on books, and so on.... fortunately the ones involved in progress do not listen. No offense, but before I watched the videos, I knew what the author looks like..... like a child full of fears. He will be strapped to a car having an anxiety attack...... while we fly. Noise will be one of the biggest problems. If people have been resistant to hobby drone traffic over their neighbourhoods, it won't be a patch on the outcry against rich folks' air cars.